Mercedes-Benz has previewed the Concept GLB, a new G-Class-inspired rugged compact SUV, at the Shanghai Motor Show (April 18-25). With its focus on spaciousness and robustness, the concept car (length/width/height: 4634/1890/1900 millimetres) has space for up to seven occupants thanks to its long wheelbase (2829 millimetres). "We asked ourselves whether there is still space between the GLA and GLC in our successful SUV range. The Concept GLB is the answer to this question. With it we are demonstrating the creative ideas we have for this segment" said Britta Seeger, Member of the Board of Management of Daimler AG, responsible for Mercedes-Benz Cars Sales. "The Concept GLB is a durable and practical SUV with nonetheless compact dimensions. Whether it is a generous, seven-seater family vehicle or a versatile leisure time companion, we are certain that this concept will be of great interest to our customers," she added. Mercedes remains strongly bullish on the SUV segment and to date, more than six million customers worldwide have bought a Mercedes-Benz SUV. In 2018, with more than 820,000 units sold, SUVs were the strongest segment for Mercedes-Benz. The butch-looking Mercedes-Benz Concept GLB has muscular proportions. The powerfully contoured vehicle shoulder dominates the side view, an effect reinforced by the rising waistline. All-round protective claddings divide the overall proportions and emphasise the vehicle's off-road character. The chrome underguard at the front with integral air inlets in a stainless steel look emphasises the off-road qualities. The rear underguard echoes this theme, creating a balanced overall picture. The rough-treaded off-road tyres are on robust 17-inch wheels in a bicolour design. 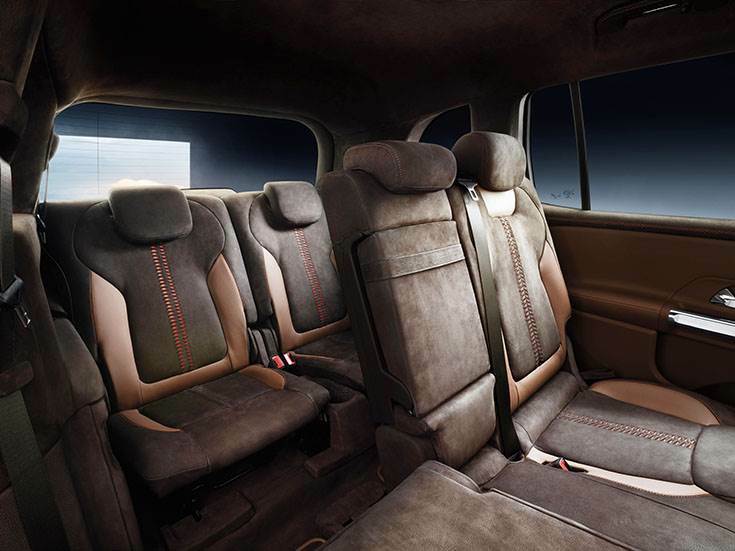 The interior of the Concept GLB abounds with special leather features and special trim elements. And for the first time in a compact model by Mercedes-Benz, a third seat row with two additional single seats that can be recessed flush into the load compartment floor to increase load capacity. These seats, according to Mercedes-Benz, are far more than emergency seats, and offer comfortable seating for two medium-sized occupants. What's more, there's flexible seat arrangement in the second and third row. To facilitate access to the third seat row, the seats in the second row have an Easy-Entry function: when the unlocking lever on the top outer edge of the backrest is operated, the backrest folds forward and the entire seat can be pushed forward. A total of four child seats can be attached in the second and third seat rows. The Concept GLB is powered by the M 260 four-cylinder petrol engine combined with an 8G-DCT dual clutch transmission, with a maximum output of 165 kW/224 hp and peak torque of 350 Nm. .